Sales volume. Overall, down slightly more than 1%. 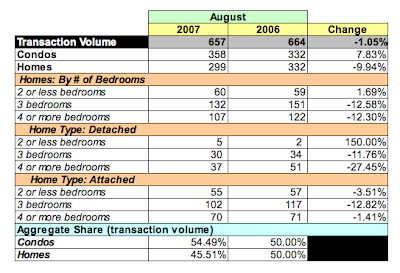 YoY, condo sales volume was up 7.83% and home sales volume dropped 9.94%. Two of three categories of single family homes saw a decline in sales volume: up 1.69% for 2 bedroom homes; -12.58% for 3 bedroom homes; and -12.3% for 4+ bedroom homes. Dollar volume. In aggregate, down less than 1%. 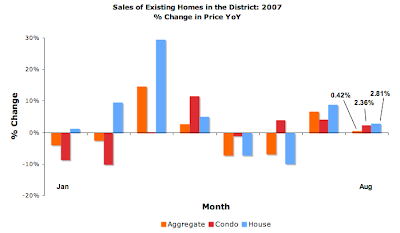 Dollar volume for condos was positive (+10.37%), homes fell 7.41%. 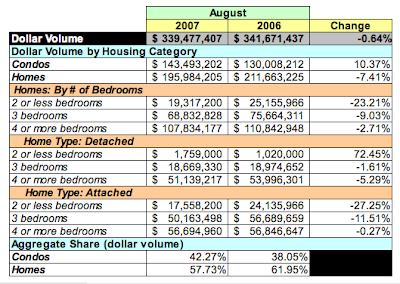 Lower dollar volume for all home sizes: -23.21% for 2 bedroom homes; -9.03% for 3 bedroom homes; and -2.71% for 4+ bedroom homes. Average sales price. Flat, up less than 0.5%. Average prices for condos rose 2.36% to $400,819 while homes increased 2.81% YoY to $655,466 [less than July's YoY average price]. Days on market. Yes, on average the DOM grew to 59 days, but a closer look shows that more than 2/3 of all homes [67.4%] sold within 60 days, a performance metric that's been pretty consistent these past few months. Inventory. Based on June's transaction rates and active listings, there is a 4.13 month's supply of condos, a decrease of 2.57% from July, while home inventories rose 25.16% to a 5.21 month's supply. 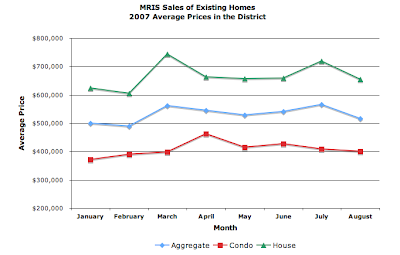 The data shows pretty clearly that home sales drive the direction of the aggregate average sales price [see below]. Since unit home sales fell in August while aggregate average prices eked out a small gain, I can only assume that, once again, the high end home market is keeping the overall market in positive territory; 6.5% of all units sold  sold for more than $1MM, 30 of which were high end homes [those with 4+ bedrooms]. In fact, average prices for high end homes spiked 30.54%. 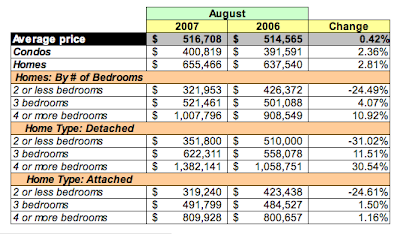 Delving into the data a little more, I find that 16 of 37 detached homes with 4+ bedrooms [43.2% of the total] sold for more than $1MM, ditto 14 of 70 [20%] semi-detached homes with 4+ bedrooms.